The inaugural Global Groundwork Index sizes up the territories where infrastructure and corporate investment are aligning for the future. For years, Conway Analytics' proprietary Conway Projects Database Site Selection uses for its rankings has qualified and tracked corporate end-user facility investments worldwide, from offices to data centers to manufacturing plants. Among the things it hasn't tracked, however, are the infrastructure investments paving the way for that corporate investment. Amtrak in October 2017 revealed the exterior paint scheme for the 28 next-generation high-speed trainsets from Alstom for Amtrak’s premium Acela Express service along the U.S. East Coast. Wouldn't it be great if some organization were matching Conway's attempts at corporate comprehensiveness with a similar effort tracking the miles of roads, bridges, airports, tunnels, pipelines, utilities, railroads and other major infrastructure projects laying the literal groundwork for prosperity? CG/LA, based in Washington, D.C., and with a legacy focus on the Americas, has been populating just such a database since 2012: Relying on the GViP network of nearly 3,200 infrastructure professionals from 160 countries, the database reflects total project value of $5.7 trillion, creating an estimated 64 million jobs on the power of infrastructure alone. The Texas Central Railway will use the same Central Japan Railway Company high-speed technology deployed in this N700 bullet train shown crossing in front of Mt. Fuji. We reached out to CG/LA President Norman Anderson and his team this summer, acquiring exclusive access to their database tracking more than 2,000 projects. Site Selection Database Administrator Daniel Boyer took it from there, building an index incorporating cost and location data from CG/LA alongside Site Selection's corporate facility location and capital investment data from the past three calendar years, performing tally and per-capita calculations. 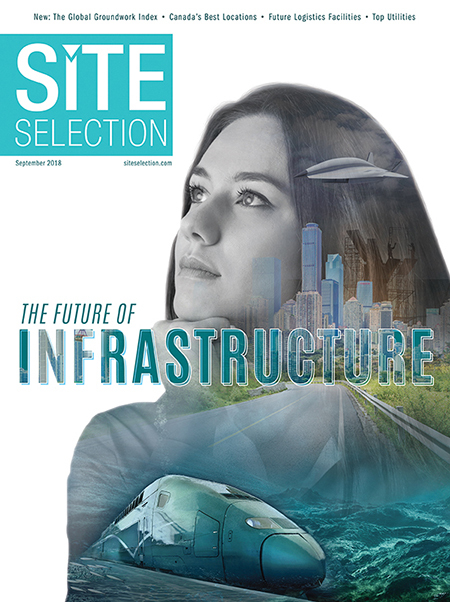 The result: Site Selection's inaugural Global Groundwork Index, casting the spotlight on territories where crucial infrastructure is already making an impact on doing business and quality of life. In addition to the Top 10 Countries and Top 10 U.S. States in that overall blend of calculations across both data sets, we also present the Top 10s based on CG/LA data only. We think you'll find it useful as you evaluate territories for your next corporate project. On the following pages is an exclusive commentary on the state of infrastructure by CG/LA President Norman Anderson. The world is going through a massive change in how infrastructure is funded and managed, and what infrastructure we build. The public sector is becoming less a source of funding, and more a manager of the performance of privately funded, operated and maintained assets. Keeping a pulse on who is building the right infrastructure in the right places is critical for long-term success, and we see clear winners and losers at this stage. Start with the funding issue. The world is moving from public to private funding of infrastructure, and this means that we need to create new ways of thinking, and new institutions, to support and channel not just private investment, but the creation of projects that attract private investment, i.e. projects that are bankable. Source: Conway Analytics’ Conway Projects Database qualifies facility investments involving new construction from corporate end users that meet one of three criteria: at least $1 million invested; at least 20 new jobs created; or at least 20,000 new sq. ft. of space. Entries in the GViP projects database are created by both project executives at the sponsoring agencies or their affiliates, and CG/LA’s own research team. Primary sources include national, state and local agencies of transportation, finance ministries, utilities, city water companies, and private-sector project developers. Additional sources include development banks, investment promotion agencies and private-sector market participants such as consulting firms and engineering, procurement and construction companies. Canada — a country that has made three significant moves toward the creation of a new infrastructure paradigm — is one of the clear winners. First, Canadian pension funds have taken to supporting private investment around the world, with Ontario Teachers leading the way. Second, Canada has created provincial public enterprises — like Infrastructure Ontario — that are enormously efficient producers of bankable projects. Third, just last year Canada launched its National Infrastructure Bank, a new institution that fills in the gaps both on the pipeline side — identifying necessary projects that for some reason haven't attracted private investment — and on the funding side, where needed infrastructure (in rural areas, for example) is not attracting needed funding. If the best — or at least adequate — infrastructure is increasingly the result of countries creating sophisticated machinery for creating and funding projects, there is an increasingly profound management issue. We see public sectors in every country playing a growing role. This may seem counterintuitive, when the goal is to bring more private investment to infrastructure, but the results of infrastructure are … public goods, and so the public sector is increasingly being revamped in order to optimize the performance of infrastructure assets for the public's benefit over a period of 30-40 years. Countries that stand out in this exercise include not only Canada and Australia, but also the UK, and especially Singapore. There also is a new entrant on the scene: technology. Trimble Connect, for example, allows the public sector to create a "digital spine," enabling an almost perfect view of a project, thus increasing the ability to manage it and the visibility of the project to the public, and decreasing the likelihood of cost overruns. Countries on the forefront of digitalization will be those building projects better, faster and as much as 15 to 20 percent cheaper. As one leading CEO said to me recently, "If you can't measure it, you can't manage it." Now, for the first time, the public sector truly can manage it. The third big issue is the infrastructure that we build. What do people want? In a recent Ipsos poll conducted for CG/LA in answer to the question "What does infrastructure investment mean to you?" 37 percent of 1,500 Brazilian respondents answered 'mobility,' and 36 percent answered 'health,' while only 4 percent said 'highways, rail and bridges.' People focus on the benefits of infrastructure, and those nations with stronger democracies tend to be better bets for long-term infrastructure project creation. Looking for Leaders? Look to the States. In terms of the United States, states with strong private investment programs tend to be ranked highest. This is a critical insight, and is going to be a massively important differentiator going forward. In a country with $1-trillion annual budget deficits going forward, look to states that create private investment opportunities, and have the machinery to support that investment, for reliable infrastructure project creation. The states ranking highest on our list are all states with significant private investment initiatives, significant energy industries, or states that serve as transportation hubs — or, like Texas, are a combination of all three. But when you are assessing the U.S., another important fact to recognize is how slow the country has been in transitioning to private investment in infrastructure. This is a big problem. Fully 87 percent of U.S. infrastructure is owned by the public sector, and of that, 93 percent is owned by states and municipalities. The U.S. is just starting the long, slow, road to building a privately fueled infrastructure investment model, just starting to mobilize its $17 trillion in pension fund money and $7 trillion in insurance funds to revitalize its infrastructure. If you want to look out at the world and see where the infrastructure puck is going, then you have to separate the signal from the noise, both in terms of opportunities for investment, and countries (and states) in which to do long-term business. There are at least three issues that jump out at me when I look out at the global horizon. The Gordie Howe Bridge will be the latest to connect the U.S. and Canada. First, countries only initiate large infrastructure initiatives in the first 12 months after elections. This is an iron rule. Take Latin America. The region will tally eight presidential elections by the time this calendar year is over, including in the largest economies in the region: Brazil, Mexico and Colombia. Every one of these countries will launch an infrastructure investment program that will be operating at full speed in 2019, with both Mexico and Brazil positioned to move their investment levels into the 4-percent-of-GDP range. Second, look for those economies that are focused on the benefits that infrastructure projects produce for citizens. Increased private investment is a double-edged sword. Unless that investment actually creates real benefits such as mobility, better health, jobs and new businesses, then people assume, and probably rightly so, that the disproportionate weight of benefits goes to investors, which almost immediately causes infrastructure investment to come to a screeching halt. Giant Panamax ships choosing the Port of Savannah are one factor driving increased rail moves from the Georgia coast to such markets as Memphis and Nashville. Third, one issue of debilitating concern all over the world is corruption. Higher degrees of corruption mean lower infrastructure investment levels, and higher project costs. We see this all over Asia, Africa, Central Asia and Latin America. Countries with high levels of corruption simply cannot sustain infrastructure initiatives. They get third-rate resources, more expensive money and worse projects at a time when projects that benefit people and economic competitiveness are increasingly complex and technologically sophisticated. Latin America is a prime example, where infrastructure investment came to a grinding halt in 2018, particularly in transport and water — the two issues most important to citizens. The Houston-DFW high-speed rail plans of Texas Central aim to carry travelers the 240 miles in less than 90 minutes. Nearly 50,000 Texan “super-commuters” travel back and forth between Houston and Dallas/Fort Worth more than once a week. When I look out at the global infrastructure market, and even when I turn my view toward U.S. states and municipalities thinking of private investment, public capacity and communities with high levels of civic engagement (this kind of trust is the opposite of corruption), I tend to focus on one question: Where is technology going to be happiest, most fiercely received, and most productively employed as a channel into the future? When you are looking at countries as possible locations for investment, turn your thinking on its head and assess who is spending the most productive time thinking about the user experience. It should be the U.S., since many of the technologies come from Silicon Valley, but many of the implementing companies are growing in other places that prioritize private investment and democratic government, including Canada, Australia, Singapore and other countries that engage citizens in build a national vision. As President & CEO of CG/LA, Norman F. Anderson focuses on infrastructure project creation, aimed at increasing the level of infrastructure investment and the performance of existing infrastructure stocks in developed and developing countries alike. In addition to advising the public and private sector, he has overseen the development of CG/LA's proprietary analytic models, including Global, Latin American and US Annual Infrastructure Capacity Rankings, and "The Eight Criteria for Assessing a Country's Infrastructure Capacity." For more information, visit www.cg-la.com. The Réseau Electrique Metropolitain (REM) project in Greater Montréal is one example of Canadian infrastructure bringing new opportunity to locations such as Technoparc Montréal, near Montréal–Pierre Elliott Trudeau International Airport. In March, CG/LA, in partnership with construction management platform Aconex, announced the winners of the 2018 Infrastructure Project of the Year Awards at the 11th Global Infrastructure Leadership Forum in Montréal. On the heels of Quebec's historic $100-billion infrastructure spending plan, the awards recognize early-, mid- and active-stage projects across five categories. Systemic solutions are identified for their outstanding commitment to strategic advancement, sustainability, engineering, opportunity creation, and finance in the face of an ever-increasingly competitive global market. Canada's high-frequency VIA Rail took home this year's award in sustainability for its pioneering work in furthering environmental responsibility, safety, and ethical development. The Bogotá Metro, the first elevated rail line of the Colombian capital, won first place in strategic advancement and opportunity creation. Construction on the u-shaped viaduct, commissioned for 2022 following a 70-year planning history, will provide up to 72,000 Colombian passengers with access to the city center per hour. Construction is expected to commence by the end of 2018 and will undoubtedly spur overall economic welfare and job creation in the region. Virgin's Hyperloop One took home first place in the engineering category for the Kansas City-to-St. Louis Hyperloop project, a high-speed route along the I-70 corridor between the two cities developed in concert with Missouri's Amazon HQ2 bid. Through a combination of low-pressure tubing and electromagnetic propulsion, among other engineering coups, the revolutionary commercial project promises to compress hundred-plus mile long trips to under an hour by 2021. The Budapest-Belgrade Railway, part of China's Belt and Road Initiative, was awarded first place in the finance category. The $900-billion project is an important international railway between the capital cities of Serbia and Hungary and will serve as a main transport route for Chinese trade. Cadiz Valley Water Conservation, Recovery and Storage Project, Cadiz, Inc.